Fanbrella's Handy Even When It's Hot And Sunny | OhGizmo! By Andrew Liszewski on 05/02/11 • Leave a comment! 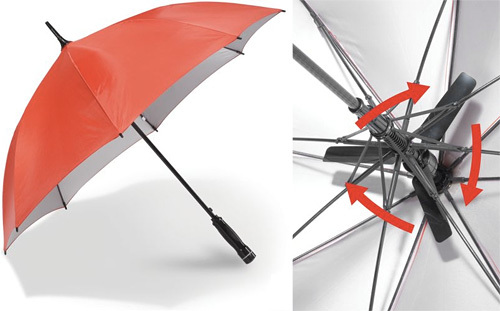 Normally you’d only need to carry an umbrella with you when it’s overcast and rainy (which seems like every single day where I’m at) but the Fanbrella looks like it’s also handy for days when the sun is beaming down. As umbrellas go it looks pretty non-descript, though I do like the use of plastic for the shaft and ribs ensuring they’re sturdy but won’t rust. But what kind of justifies its expensive $79.95 price tag is a built-in motorized fan located underneath the canopy. It spins at 650 rpm refreshing the user with a constant downdraft, and the three plastic blades collapse along with the rest of the umbrella so it doesn’t have a bigger footprint when not in use. It does require a constant diet of 6xAA batteries crammed in the handle which keep the fan running for about 5 1/2 hours, which makes me wonder if a solar panel and rechargeable batteries could be integrated into its design somehow.